From the inside, the Realistic PRO-2021 and Handic 0060 are identical. The scanner can be opened by removing the 5 screws of the top lid. 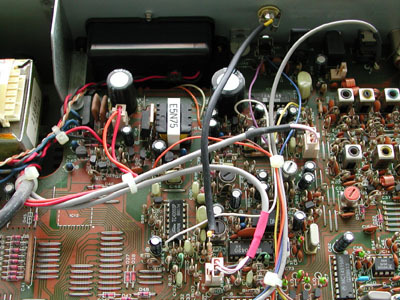 I also disconnected the loudspeaker PCB-connector, which makes the scanner easier to handle. There are 2 options for a discriminator output: directly to pin 9 of the discriminator IC, a TK10420. 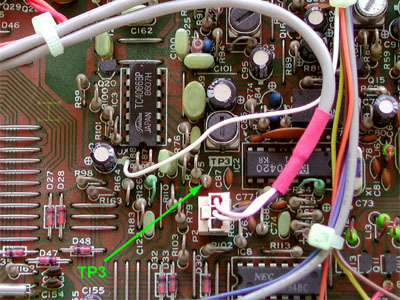 Or to TP3 (test point 3), which is connected to this IC directly. I chose for this last option, so that I didn't have to solder to the IC. TP3 consists of a 0 Ohm resistor, mounted vertically. I connected a 10 k resistor to the free end of this resistor. The inner connector of a piece of shielded cable is connected to the RC-joint. The braid is soldered to the metal shield of the IF coil close to TP3. 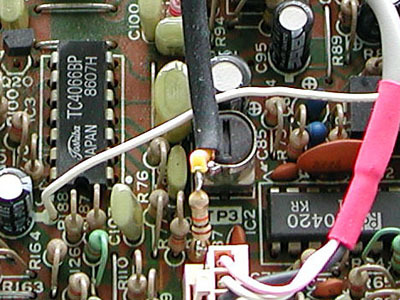 The other side of the shielded cable was connected to a 3.5 mm chassis terminal mounted in the back of the scanner.